New technology from researchers at the University of Texas Southwestern Medical Center enables the ability to study cancer cells in their native microenvironments. Imaging research is one step closer to giving clinicians a way to do high-resolution scans of malignant cells in order to diagnose cancer and help identify useful therapies. If this technology were to prove successful in clinical studies, it might change how anatomic pathologists and radiologists diagnose and treat cancer. Researchers at the University of Texas Southwestern Medical Center developed a way to create near-isotropic, high-resolution scans of cells within their microenvironments. The process involves utilizing a combination of two-photonBessel beams and specialized filtering. 1. The microscope design must not prohibitively constrain microenvironmental properties. 2. Spatial and temporal resolution must match the cellular features of interest. 3. Spatial resolution must be isotropic to avoid spatial bias in quantitative measurements. This new technology offers pathologists and medical laboratory scientists a new look at cancer cells and other diseases. The study notes that meSPIM eliminates the influence of stiff barriers, such as glass slide covers, while also allowing a level of control over both mechanical and chemical influences that was previously impossible. One such difference is the appearance of blebbing. Created by melanoma cells and lines, these small protrusions are thought to aid in cell mobility and survival. Using meSPIM, observers could follow the blebbing process in real-time. Formation of blebs on slides and within an extracellular matrix (ECM) showed significant differences in both formation and manipulation of the surrounding microenvironment. The team is also using meSPIM to take a look at membrane-associated biosensor and cytosolic biosensor signals in 3D. They hope that investigation of proteins such as phosphatidylinositol 3-kinase (PI3K) and protein kinase C will help to further clarify the roles these signals play in reorientation of fibroblasts. One significant issue associated with the use of meSPIM is the need to process the large quantity of data into useful information. Algorithms currently allow for automatic bleb detection. However, manual marking, while time consuming, still provides increased accuracy. Researchers believe the next step in improving the quality of meSPIM scans lie in computer platforms designed to extract and process the scan data. Until this process is automated, user bias, sample mounting, and data handling will remain risks for introducing errors into the collected data. Yet, even in its early stages, meSPIM offers new options for assessing the state of cancer cells and may eventually provide pathologists and radiologists with additional information when creating treatment plans or assessments. Extracted surfaces of two cancer cells. (Left) A lung cancer cell colored by actin intensity near the cell surface. Actin is a structural molecule that is integral to cell movement. (Right) A melanoma cell colored by PI3-kinase activity near the cell surface. PI3K is a signaling molecule that is key to many cell processes. Credit: Welf and Driscoll et al. Cancer cells don’t live on glass slides, yet the vast majority of images related to cancer biology come from the cells being photographed on flat, two-dimensional surfaces—images that are sometimes used to make conclusions about the behaviour of cells that normally reside in a more complex environment. But a new high-resolution microscope, presented February 22 in Developmental Cell, now makes it possible to visualize cancer cells in 3D and record how they are signaling to other parts of their environment, revealing previously unappreciated biology of how cancer cells survive and disperse within living things. 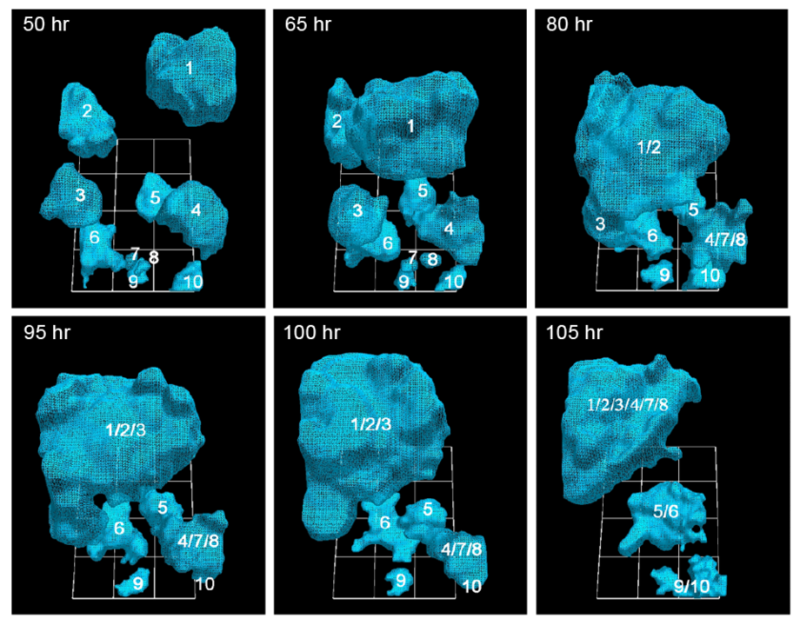 Two University of Iowa studies have recorded the movements of cancerous human breast tissue cells in real time and in 3D — the first time cancer cells’ motion and accretion into tumors has been continuously tracked, the researchers believe. The team discovered that cancerous cells, moving at move at 92 micrometers per hour (about twice the speed of healthy cells), actively recruit healthy cells into tumors by extending a kind of cable to grab their neighbors — both cancerous and healthy — and reel them in. Surprisingly, as little as five percent of cancerous cells are needed to form the tumors, a ratio previously unknown. In the AJCR paper, the researchers found support for their previous observation that tumorigenic cell lines and fresh tumor cells possess the unique capacity to form tumors by the active formation of cellular cables. The Developmental Studies Hybridoma Bank funded the study. * Soll’s Monoclonal Antibody Research Institute and the Developmental Studies Hybridoma Bank, created by the National Institutes of Health as a national resource, directed by Soll and housed at the UI, together contain one of the world’s largest collections of antibodies that could be used for the anti-cancer testing, based on the new findings. Recently, we demonstrated that tumorigenic cell lines and fresh tumor cells seeded in a 3D Matrigel model, first grow as clonal islands (primary aggregates), then coalesce through the formation and contraction of cellular cables. Non-tumorigenic cell lines and cells from normal tissue form clonal islands, but do not form cables or coalesce. Here we show that as little as 5% tumorigenic cells will actively mediate coalescence between primary aggregates of majority non-tumorigenic or non-cancerous cells, by forming cellular cables between them. We suggest that this newly discovered, specialized characteristic of tumorigenic cells may explain, at least in part, why tumors contain primarily non-tumorigenic cells.